The Burke-Gaffney Observatory, after its vacation, imaged Messier 25 for me. Another Messier catalogue object I had viewed once or briefly or both. 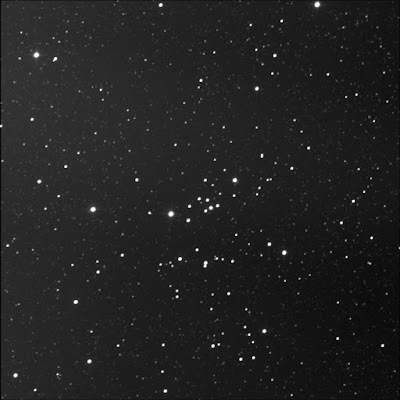 It is a loose open cluster in Sagittarius. A mixture of bright and dim stars. 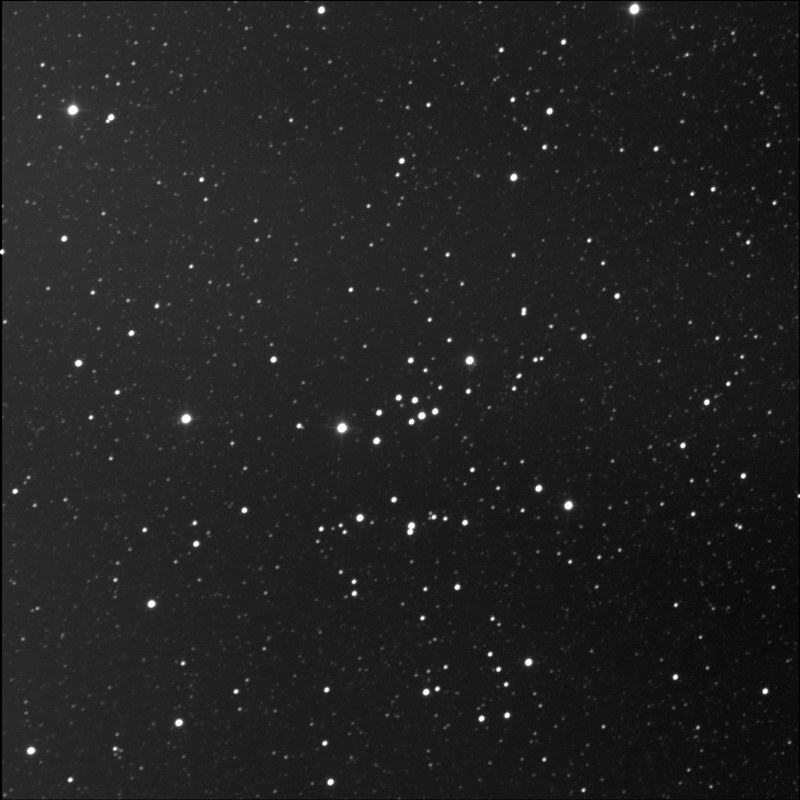 There seems to be two streams, an upper with the bright stars, and the lower, with a lane between void of points. I like the little lines of 3 stars sprinkled about. There are many faint, fine stars in the background as we're in a dense part of the Milky Way, not far from Galactic Centre. I look forward to seeing this in colour as I expect there to be lots of colour. There's a bit of a gradient on the left edge of the image: the Moon was not far away. Still, I'm pleased with the result. U Sgr is the brightest star left or east of centre. SkyTools 3 Professional shows that this is a multi-star system with around 20 elements! U is in this upper channel of stars. B is the closest bright star to the west-west-south. ST3P shows another star is here too, U, but B and U points are merged in the image. C is to the south-west in the lower channel. C looks by itself like a classic double star with the nearby bright neighbour. ST3 however does not note the star south of C. Strange. There is no D consort according to the software. E is to the west of A, up or north very slightly. It is in the middle of the nearly perfectly straight line of 3 rather bright stars. The right-most or west-most star of this line is F.
G is far-flung. It is in the lower thread, to the far west, the brightest star on the west edge of the cluster. It is west-south-west from A.
H however is very close to A, to the west-north-west. It is slight further than B. It is due north of B. It is slightly dimmer than B.
ST3P does not show an I sidekick. J is north-west of H at less than the AB separation. J is equally bright as H.
K is close to J and almost due west. It is a touch brighter. It is almost due north of E and almost the same split as K and J. Back to the line of 3 bright stars with E in the centre: L is the east-most star, opposite F, dimmer, slightly closer. M is quite far north, above J and K, and very slightly dimmer. There is no N or O stars. P is almost due south of A and almost due east of C. It is about the same magnitude as C.
Q is between P and C but to the north, forming an isosceles triangle. It is dimmer than all. R is due east of A. It is somewhat dim. Slightly greater separation than AH. Interestingly, there's a very faint star really close to R.
S is a bright star to the west-north-west of A, well away, beyond J and K. It is the same mag as G, possibly a touch brighter. S is due west of M.
Speaking of G, the T star is near G, to the east-north-east. T and B appear the same brightness. Cool. I spotted all the elements excepting B and U which appear as one. North-west of the centre of the cluster is a faint and tight pair. SkyTools labels both of the stars GSC 06274-1098. Odd. SkyTools shows a designated pair nearly due south of the GSC 06274-1098 thing and due west of U Sgr S: ARA 753. It shows the B star due south of A with a separation of about 5 arc-seconds. The image shows a faint star west of A, with a position angle around 275° and what appears to be a wider angular separation. Will need to check the Washington Double Star database for that one. There's something odd to the south-east as well. The image shows what might be a tight pair. Curiously, the orientation that ST3P shows for ARA 753! What's going on?! Assembled in colour on 8 Dec.